Where Do Backpackers Go in Vietnam? A Review of Hostels and Guesthouses. How much does it cost to travel to Vietnam? How much money will you need in Vietnam? d969,623 ($42) is the average daily price for traveling in Vietnam. The average price of food for one day is d221,480 ($9.55). The average price of a hotel for a couple is d1,008,546 ($43). Additional pricing is in the table below. These average travel prices have been collected from other travelers to help you plan your own travel budget. Vietnam is a country rich in culture and history. It's an ever changing country that is forever working to increase its tourism base. Although the growing tourism industry is improving the country's economy, the travel infrastructure often has the feel of mass marketing that flocks visitors from one attraction to the next. Still, it is possible to step outside of this structured vacation and see more of the Vietnam that has existed for centuries. Despite its popularity as a travel destination for Australians and Europeans, for many American's Vietnam still conjures up memories of a long ago war. Once you arrive in this culturally rich country, you will find a place that has changed dramatically in the recent decades. Bicycles have been replaced by motorbikes, and more recently motorbikes are being replaced by cars. Towns have been restructured to offer amenities to visitors. Restaurants cater to both local and western palates. It's a country that sees the benefit of attracting foreigners, and it's still working out the best strategy to combine authenticity with convenience. Vietnam's long narrow geography make it somewhat difficult to navigate, but this unusual shape also gives it a wonderful diversity of landscape and culture. In the north you can experience rural life in the mountainous Hmong communities around Sapa. As you head to the far south you can have the incredible experience of riding a boat through the floating markets on the Mekong Delta. In the middle you can dine on some of the country's best cuisine in Hoi An, or you can shop for tailor made cloths in any number of towns. Vietnam has embraced the tourism industry, and you can feel this at almost every corner. In markets you must negotiate hard with shopkeepers eagerly hoping to sell you a souvenir. Keep the bartering light, and negotiate with a smile and the experience will be far more fun for both sides. Many people make the trip through Vietnam by traveling north to south. Buses are the most affordable option, but the trips can be long and are often overnight. If you're short on time consider taking at least one or two flights. They are reasonably priced and will save you a lot of time. The unfortunate downside of flying is you will likely miss out on some of the more interesting small towns in Vietnam. Haggling is part of the experience in Vietnam. If you keep it lighthearted and fun you'll find it less frustrating. Remember to cut the price to less than half of the originally offering price. It also helps to walk away a couple of times before settling on a price. This will help you see exactly what you should be paying for an item. Many people take the "VIP" buses through Vietnam. These can be arranged in your hotel or through any of the many travel agencies around town. Generally, all of the buses are comparable in quality. Many do break down, so be prepared. Wherever you decide to purchase your ticket, negotiate hard, because prices are often dramatically marked up. If you decide to purchase some tailor made cloths, most people do this in Hoi An. Make sure you have a few days in town and do your shopping on the first day. You'll want a few extra days in case the clothes don't fit appropriately and need to be resized. There are tailors of varying quality and you generally get what you pay for. There are plenty of western style restaurants throughout Vietnam, particularly in the more touristy areas. These restaurants are often dramatically more expensive than their local counterparts, and they are often a poor reflection on western cuisine. Stick to the local restaurants that serve up Vietnamese food and you'll save yourself a lot of money and have more interesting and delicious meals. Some of the more popular areas in Vietnam are almost always visited as part of a tour. These areas included the Mekong Delta and Halong Bay. Despite the appearance that you must visit these areas as part of a tour, it is very possible to travel to them independently on local buses or boats. The experience is often more enjoyable and memorable as well. Halong Bay: This is one of the most popular attractions in all of Vietnam. It's a beautiful bay where islands jut out dramatically from the water making for a stunning scene, particularly in the evening and early morning hours. Most visitors come to Halong Bay as part of an organized boat tour which typically lasts several days. Mekong Delta: This is a beautiful area in southern Vietnam where you can visit floating markets and see rural Vietnamese life. You can ride on boats through canals and visit local villages where tropical fruit and seafood are the norm. 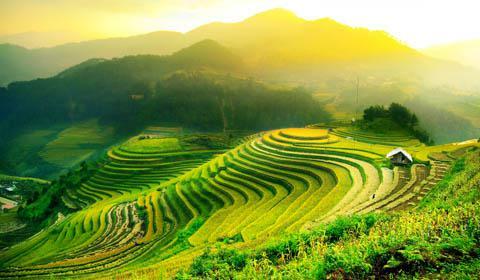 Sapa: Located in the very northern part of Vietnam the beautiful mountains around Sapa are lined with rice terraces. You can hike through the interesting Hmong villages and shop at local, weekly markets. Vietnamese food is really about excellent street food. Whether you're enjoying fried spring rolls in Hanoi or a hot bowl of pho in Saigon, basic, fresh ingredients are really what it's all about. Don't feel like you have to spend a lot of money to have the most delicious Vietnamese meal. Instead, step into a back alley that is lined with hot grills frying up the country's best specialties. This is where you'll find the best food in Vietnam. Pho: This flavorful dish a traditional broth based Vietnamese soup made from noodles, meat, basil, vegetables and spices. It is served in large bowls with sides of fresh basil and sprouts which you can add to your liking. Com tam: This meal of grilled pork is typically served with rice and a sweet and sour sauce. It's a popular meal at lunch or dinner and has a surprisingly rich flavor making it a favorite for many travelers. Banh xeo: This is a traditionally local dish that is made with a rice flour crepe. It's cooked like a pancake and made with turmeric. It's usually served with shrimp and vegetables on top. Several different bus companies offer bus tickets that can take you up or down the entire length of the country. You can buy one ticket and travel the whole length of the country stopping off where ever you like. All you need to do then is reserve your seat for the next leg of the journey. Many of these legs, however, are overnight buses, so don't expect to get much sleep, or a comfortable sleep. The routes go from Hanoi, through Ninh Binh, Datong, Hue, Hoi An, Nha Trang, Dalat, and then to Saigon. If you're going to Sapa in the north, take the train, it's very comfortable. If you're headed to Can Tho, the Mekong delta, or the Cambodian border in the south, you can catch frequent local buses from Saigon (or take one of the many multi-day tours through the region).